This contest is a bit different from our previous contests. The provided link is to a single image of multiple grayscale images. One image is the red channel, one is the blue channel, and one is the green channel. There are various ways of combining them to make a color image. My approach would be to first create each grayscale image as its own layer and lower the opacity to make sure that they all line up (using the difference mode may also be helpful). Once you have the images lined up, I would crop the overall image to remove the extra areas. Next you will need to create each layer as its own individual grayscale image—same pixel dimensions. Remember that the new images must be flattened (have no layers). Then combine the multiple grayscale images as channels into a final single image. The result will be a color image. Once you have your color image, then you will need retouch it as necessary to complete the color restoration. 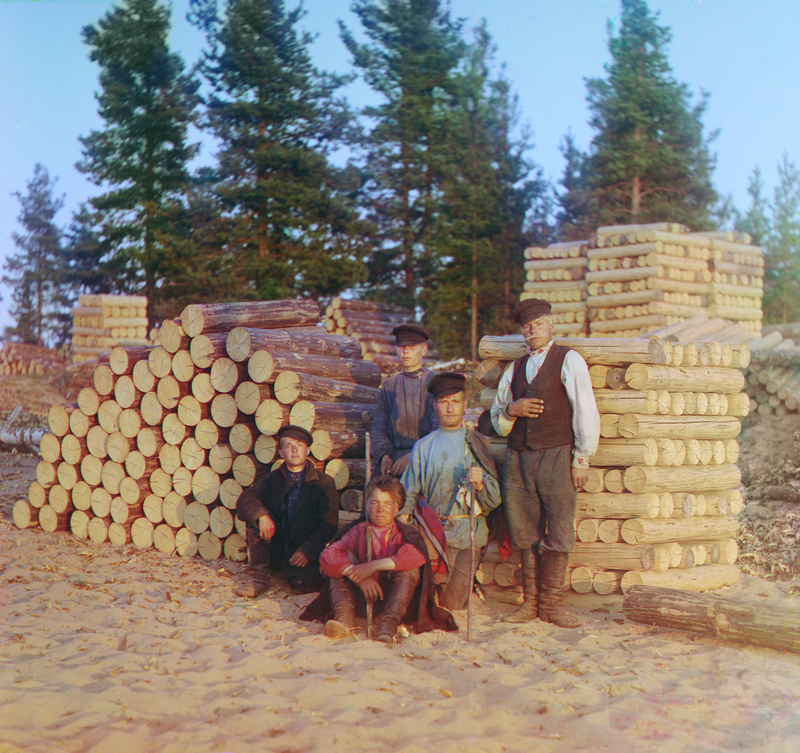 Source Image: Woodcutters on the Svir River. Courtesy of Library of Congress. Note you only need to download ONE of the files. The files are of the same image, just in different file formats for ease in downloading. 1. Open the grayscale images containing the channels you want to merge, and make one of the images active. You must have more than one image open for the Merge Channels option to be available. 2. Choose Merge Channels from the Channels panel menu. 3. For Mode, choose the color mode you want to create. The number of channels appropriate for the mode appears in the Channels text box. 4. If necessary, enter a number in the Channels text box. If you enter a number that is incompatible with the selected mode, Multichannel mode is automatically selected. This creates a multichannel image with two or more channels. 6. For each channel, make sure the image you want is open. If you change your mind about the image type, click Mode to return to the Merge Channels dialog box. 1. Contest will run from 9 Aug to 21 Sep 2014. Deadline for entries is 6pm (U.S. Central Time). Combine the provided grayscale images into a single (one frame) color image. Retouch the resulting color image as necessary to complete the restoration into a quality color image. 7. Voting will run from 22 to 28 Sep 2014. Only those with entries may vote. This is where I got to after a quick couple of hours. I realise the it requires a little more attention with colour work and cleaning up, although not sure if I will have any free time. Last edited by Foghorn002; 08-13-2014, 05:49 PM. Whew, that was interesting! Hope you like this version! After cropping the three versions to different files, I copied and pasted to a single file. I hid one of the upper copies, turned the other down to 50% opacity, and aligned with the bottom layer. Then I switched other layer on, the first copy off, and aligned with 50% opacity again. Set the both upper layers to 100%, chose a selection that avoided the black frame (and some trash) in each image, then cropped. Each layer was copied and pasted to a new open file, and flattened. I adjusted levels on each one to visual consistency. I chose one to set to multichannel, pasted in copies of the others as new channels, then converted the mode to RGB. (And Got Lucky! Not sure if Photoshop analyzed to see which was red, green, or blue, but it came out fairly well. I was expecting to go through trial and error to get the right combination.) I used Topaz Clarity and iCorrect EditLab Pro to adjust hue, saturation, and tone. There were areas with color problems in the trees and on the right. I selected the dark tones of the trees and replaced the color with a foliage yellow-green, then decreased the saturation so it wasn't as obvious. On the right, I borrowed color from the left to recolor the right, though it wasn't as successful as I hoped. Final run through iCorrect and save. I've never tried merging channels before, so I was interested in how it's done. I followed the instructions posted above (from Adobe.com and Moderator T Paul) and was pleasantly surprised. What's here is what popped out after OK'ing the Merge Channels dialog box, and I tweaked the Color Balance a tad just to see what would happen. The 3 images seemed to have aligned pretty well and the color balance isn't too weird. I can see why you have a pretty long contest period--there's one heck of a lot of retouch/restore work to do on this after one finally gets the color right, and I haven't yet. The question is, am I at least in the ballpark regarding the nuts & bolts of producing the image itself? Comments and criticism welcome. Here's my take. Would have loved to do more retouching but I'm afraid I can't stop. Last edited by edgework; 08-14-2014, 01:00 PM. First of all I found that channel red was overexposed, so I corrected levels on each of them before starting with anything else. I did not only align the channel layers, I also dealt with the chromatic aberrations due to the fact that the guy in the middle moved (and white shirt plus faces from other two boys) and cleaned the artifacts from the image as if restoring an old photograph, only that because it was being kept in different channels weathering affected them differently so this had to be dealt with three times, one for each layer separately. Finally I applied some good ol' frequency separation technique to sharpen the focus and blur any disturbing details. I could really go on a little longer... but I guess I'd rather go out for a coffee... so here it is! . And by the way, feedback is greatly appreciated. Last edited by kuasar; 08-14-2014, 12:23 PM. Not sure if this worked? Thanks for any help! Last edited by justanartist; 08-22-2014, 02:40 PM. This is my try. Thank you. If you have any questions regarding my entry please let me know. Last edited by philipwarner2000; 08-17-2014, 09:29 AM. Here is my take of this image...Let me know what you think! First time submitting as well!! Here's my attempt. It took me around an hour and a half. Good fun, especially trying to get the alignment on the faces. Those guys obviously couldn't keep totally still for three separate long exposures!